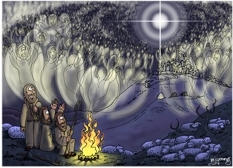 The campfire provides a warm light that is reflected off the shepherds. 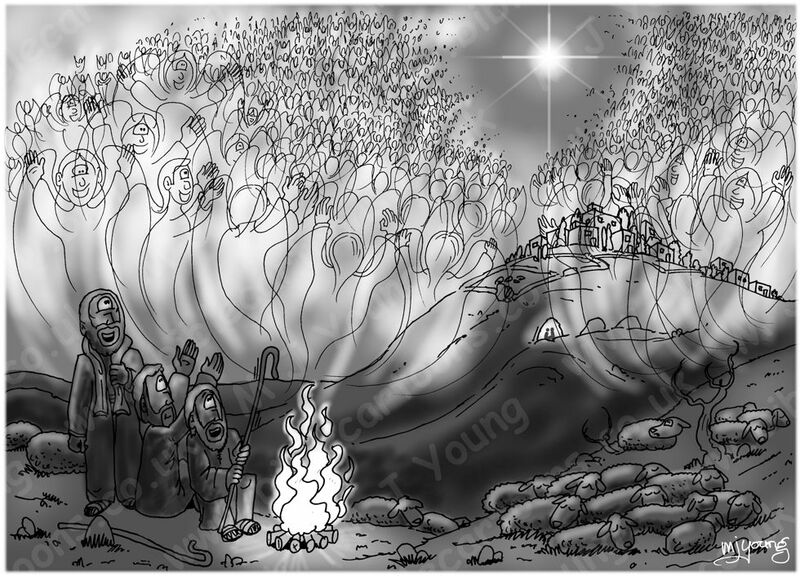 The star & the angels also provide a glowing halo of light to the scene. The cave where Jesus was born (on the hillside below Bethlehem & the angels) also has a glow from a campfire. 3 shepherds & lots of angels. Google Earth location & orientation = 31° 42’ 37.18” N 35° 12’ 52.46” E looking SW towards Bethlehem, which can be seen in this cartoon on the background hilltop. I decided to focus this scene on the shepherds & angelic host. Jesus’ birthplace is often depicted as being in a wooden stable, but there is also reference to Him being born in a cave. I have selected this option for this cartoon. You can see the glow of the campfire in the entrance to the cave, (with 2 dark caves to the right) on the hillside, below Bethlehem. I like the contrast between the warm campfire colours & the cold, blues & purples of the surrounding landscape, & also between the campfire & the cooler, white/yellow glow of the angelic host. I wanted one ewe (sheep) to have woken up & witnessed the angelic host, in this picture!